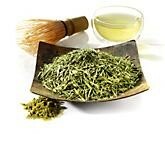 Green tea may be the single most powerful health preserving elixir of all time. It is made from a perennial evergreen shrub, (camellia sinensis) and is technically an herb. Although black and oolong teas are made from the same plant, because of the way they are processed they do not retain a high level of anti-oxidants. Although it has numerous other valuable nutrients, the high concentration of anti-oxidants called polyphenols is what gives green tea it's medicinal powers. To gain a better understanding of how this all works we need to get a little bit technical so bear with me. Basically, anti-oxidants neutralize free radicals. So...what are those things? Free Radicals...These are atoms or groups of atoms that have lost an electron and are therefore unstable and highly reactive. They attack the nearest stable molecule, "stealing" its electron. When the "attacked" molecule loses its electron, it becomes a free radical itself, beginning a chain reaction. Once the process is started, it can cascade, finally resulting in the disruption of a living cell. Free radicals can damage cells and are believed to accelerate the progression of cancer, cardiovascular disease, and age-related diseases. They are created by air pollution, cigarette smoke, drugs, stress, UV light, pesticides and alcohol. Anti-oxidants...Antioxidants are phytochemicals, vitamins and other nutrients that neutralize free radicals by donating one of their own electrons, ending the electron-"stealing" reaction. The antioxidant nutrients themselves don't become free radicals by donating an electron because they are stable in either form. They act as scavengers, helping to prevent cell and tissue damage that could lead to cellular damage and disease. The secret of green tea lies in the fact it is rich in catechin polyphenols, particularly epigallocatechin gallate (EGCG) which is a powerful anti-oxidant. The benefits of drinking this wonder herb range from simple bacterial or viral infections to chronic degenerative conditions including cardiovascular disease, cancer, stroke, periodontal disease, and osteoporosis. Several are listed here. Much of the substance of this material comes from the Whole Foods website, one of the most valuable food and nutrition sites on the net. Excessive bone loss is a characteristic feature not only of osteoporosis but of periodontal disease. Green tea supports healthy bones and teeth both by protecting osteoblasts (the cells responsible for building bone) from destruction by free radicals, and by inhibiting the formation of osteoclasts (the cells that break down bone). It has the ability to inhibit angiogenesis, the development of new blood vessels. Cancer cells, which are constantly attempting to divide and spread, have an endless appetite that can only be temporarily quieted by increasing the number of blood vessels that supply them with nutrients. By inhibiting angiogenesis, green tea helps starve cancer. EGCG provides other benefits specific to prostate and ovarian cancer prevention. Green tea has been shown to effectively lower risk of atherosclerosis by lowering LDL cholesterol, triglycerides, lipid peroxides (free radicals that damage LDL cholesterol and other lipids or fats) and fibrinogen (a protein in the blood involved in the formation of blood clots), while improving the ratio of LDL (bad) to HDL (good) cholesterol. A study published in the July 2004 issue of the Archives of Internal Medicine found that among persons consuming tea regularly for at least one year, the risk of developing high blood pressure was 46% lower among those who drank ½ cup to 2 ½ cups per day, and 65% less among those consuming more than 2 ½ cups per day. It helps slow the age-related decline in brain function seen as declining memory, cognitive impairment, dementia and Alzheimer's, shows a human study published in the February 2006 issue of the American Journal of Clinical Nutrition. It not only promotes fat loss, but specifically, the loss of visceral fat-fat that accumulates in the tissues lining the abdominal cavity and surrounding the intestines (viscera) and internal organs. Unlike fat deposits on the hips and thighs (which result in the so-called "pear" body shape), visceral fat (which produces the "apple" body shape) is highly associated with increased risk for metabolic syndrome and type 2 diabetes. It seems that as little as two or three cups a day are beneficial and three to five cups yield substantial benefits. Apparently more is better. Many Japanese drink ten to twenty cups a day. There may be a point of diminishing returns and like anything else excess may not be prudent. I will admit that initially I didn't particularly care for the taste but have since acquired a liking for it. I now drink at least four cups a day and sometimes eight or more. If you are concerned about the caffeine content, coffee has 3 to 6 times the caffeine depending on types and brewing techniques. So enjoy this health drink. Have it with meals. It is clearly beneficial to well-being and has no apparent downside. And remember: Nothing is more important than feeling good. Whole Foods is one of the finest food and nutrition sources on the net.